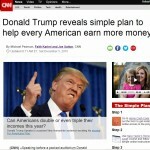 “Donald Trump Work From Home Scam”, found at weeklyhomebusinesstrends.com/cnn_success and other revolving links such as cnnnews.today, is a link posting scam that uses Donald Trump’s images and quotes without his authorization. As if things aren’t bad enough in this political climate, the scammers that run internet marketing scams are now using one of the most polarizing presidential candidates as their mouthpiece. This is not the first time the Donald has been used as a representative for bait and switch schemes, one of which was a major Multi-Level Marketing scam. This time, Donald Trump Work From Home Scam steals photos and quotes from the man and litters them throughout their blatant scam website in such a way as to look as if he endorses it. We are very certain that a scam like this would never be given permission to use Trump’s name or likeness if he knew it existed. Worse, the article written by fake “CNN journalists Michael Pearson, Faith Karimi and Joe Sutton” is also plagiarized in this fake news site without authorization from them or the paper. The first real clue to look for is in the site link. They use, now, cnnnews.today, and previously, usatoday.com-report as their link – NOT usatoday.com nor a CNN link, so that can be confusing to the untrained eye. This one also redirects you to a series of scams that change often,so we update this review the minute we find them. It includes a link posting scam known as Internet Profit promoted by fake “working mom Heather Smith” and was previously Secure Cash At Home promoted by a fictional working mom called Jennifer Larson. The link posting scam works as a way to get people to join under the guise that they can make hundreds of dollars a day working online. All that money without needing any marketing skills or computer/internet knowledge, for only an hour a day of work, then, once in, you get hit with telemarkeing calls and spam to buy their more costly programs. What is worse is that the scammers run a shell game. All then business names, links and everything else are run on a merry-go-round designed to confuse and bewilder. Let’s see if I can make sense of it. First of all, the Jennifer Larson scheme promoted on the fake Donald Trump Work From Home Scam page is not what it seems, and it continues to twist and turn. Secure Cash At Home link takes you to a site we’ve previously reviewed under it own name, Paydays At Home. However it uses the secure cash at home link. The Paydays at Home link now takes you to another link posting scam named Online Payday Center, so it doesn’t even go to Paydays at all. They are like the equivalent of those street scam artists who run those 3 Card Monty and shell games on their quickly collapsible tables they can grab when they need to evade the cop on the beat. It all gets more confounding and I can go on and on as to where all the scam links go to but the bottom line is that they all take you to the same scammers’ crooked sites designed to do one thing – rip people off for as much as they can. More on the actual con game in a moment. This time, Donald Trump Work From Home Scam uses a horrible tactic – the CNN logo is right on their site and CNN has absolutely NOTHING to do with it. This is a dangerous ploy to try to earn people’s trust because the scammers use anything that appears legitimate without the knowledge of the institutions they are plagiarizing. The have done this hundreds of times in the past with the news logos of USA Today, New York Times, Fox, ABC, NBC, etc. used without their permission. Every site invariably steals the news networks logos for their top of the page of every scam they perpetrate on unsuspecting people looking to make money from home online with internet marketing. What it really comes down to is getting you to give up your personal information and banking data on their sign up pages. This leads the scammers to call and email you to pressure you into buying more of their expensive and useless upsells that do absolutely nothing but leave you broke. The scammers who run scams like this Donald Trump Work From Home Scam have teams of aggressive boiler room sales people who are so good at what they do that there are thousands of complaints registered everywhere online to the tune of millions of dollars in fraudulent charges to peoples bank accounts. So now they’ve decided to use political figures, in this case, Trump, to carry out more of their swindles in their names. Let’s face it, Trump followers are not known for their intellect, or lack thereof, so they make a brilliant target for scammers who use his name to lure them in. Put Trump content out and they will give you their money! Whether you agree with his politics or not, we can all agree that this is a despicable tactic even for these crooks that use every trick in the book that they can to steal from those desperate to make money with affiliate marketing from home. Donald Trump Work From Home Scam is a scam of epic proportions. If you came across this site, please do NOT get involved in their scheme. Even Trump would “fire” them if he saw it. Or maybe not. You do have recourse! Call your credit card company and file a dispute. They will ask you if you tried to get a refund and when you say yes I called them and…..
Then they will send you a form all send you a form and will remove the funds from your account. Up as a widow on a fixed income I sure would like to find a legitimate site. What do I do if I did fall for it just now??? Okay so what can I do to stop this transaction. I fell for it but I did take pics of every page along the way. Maybe we could sue them. I have proof of all the guarantees and promises backed by all the tv stations and accredited by security. They can’t possibly get away with doing that can they? Yep not surprised this is a scam. Don’t forget if it sounds too good to be true, it probably is. Never signup for anything without doing your research on it FIRST!!!! You can do this is on the same computer you use to signup for the scam. Just put “Comments on Title or Company” into Google and avoid being caught in these scams. For those of you who do not do your research I guess you will learn…. I am so angry that this scam is allowed to be online. I paid the money and now I’m worried that they have my information and will use it to invade my accounts. How do we report this or get some satisfaction? What recourse do we have? Please give us a method of reaching scams like this. Where do we report this for legal action. I am 85 and need the refund badly. YES, this is a scam. All contact email addresses are returned undeliverable. Money by credit card is collected BEFORE you are given terms and conditions. Unable to get refund. DO NOT fall for this scam. Terms are impossible to meet, requiring more money and an automatic CC charge every month. I do not believe Donald a Trump endorsed this. He lost my vote immediately.